A simply amazing one bedroom serviced apartment in Grand Millennium featuring generous accommodation that has been refurbished to a high standard and offers en suite facilities, high ceilings, lift access and gorgeous communal gardens. Key features of this property including recently refurbished one bedroom high floor flat with lift, contemporary yet elegant décor, modern fittings and fixtures, sought-after location in Beijing CBD. Please feel free to contact our consultant. 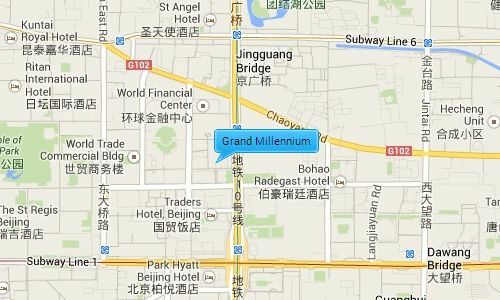 Grand Millennium is located in the popular CBD business area near to many of its landmark buildings such as the Kerry center, China world trade center and the CCTV headquarters, and many facilities including restaurants, shopping malls, health centers, international schools and supermarkets. It is a mere 10 min drive away from Chaoyang Park and the Sanlitun area..